• Resident: "I can't tell you who they are. They will kill me." Editor's note: In our Behind the Scenes series, CNN correspondents share their experiences in covering news and analyze the stories behind the events. Here, CNN's Arwa Damon describes a recent tour of the Iraqi city of Baquba. 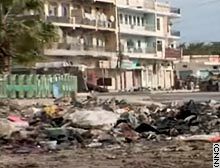 BAQUBA, Iraq (CNN) -- "Watch out for snipers," one of the soldiers said as I stepped out of the back of a Bradley fighting vehicle and stared at the deserted street. Shops were shuttered, and mountains of trash were piled everywhere. I felt a wave of shock. When I had walked these streets less than a year ago, the air was filled with the buzz of shoppers, vendors screaming prices and blaring car horns. Rows of stalls were filled with everything from fruits and vegetables to women's lingerie, electronic equipment and music. It was a bustling marketplace. As I toured the area, down one of the alleys, there was a cluster of people. "It's been like this for about four months now. Everything just shuts down after 11 [a.m.] because that's when they come and they kidnap and murder," one Iraqi said. "But I can't tell you who they are. They will kill me. No one can say who they are." "They" are extremist groups -- Sunni and Shia -- and criminal gangs. At a minimum, it costs $10,000 to buy freedom from the kidnappers, and that's still no guarantee they won't kill you. I pressed on. Four women peered down from a balcony and waved, a man rode by on a bicycle, and an empty bus rumbled down the street. Baquba is the provincial capital of Diyala, an ethnic microcosm of Iraq. It is plagued with a variety of Sunni insurgents, Shiite militias and al Qaeda in Iraq terrorists. It was always volatile -- one of the so-called "trouble spots" -- yet it still had a local government that functioned. 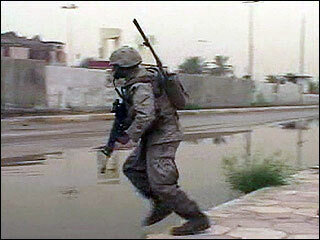 It also had some of the better trained Iraqi Security Forces. But it was a city that was always on the edge. At the main police headquarters, where in December 2005 CNN's Anderson Cooper broadcast his show from the roof, we couldn't even go as far as the outdoor stairs. Inside, the Iraqi police -- none of whom would speak on camera -- told a story of deteriorating security and a corrupt chief of police who was fired, but only after too much damage was done. They pointed out the pictures of policemen who had been slaughtered by the insurgents. They all blamed al Qaeda's increasing influence in the area. But al Qaeda is just one part of the equation. It seems as if everything that had been simmering below the surface here has suddenly exploded. "It's become a sectarian issue and we are sick of this," said Ismail Rashid. "Why can't the Americans secure this? They can do anything. They have eyes in the sky. They can see everything." Rashid's anger and frustration are palpable. He has 10 shops here and all of them have been closed for the last six months, he said. The American troops here are stretched thin. They are not only physically fighting the various diverse elements of the insurgency, but also a battle of perception. "Those terrorist groups have begun to take advantage of a perception of unwarranted fear that is now becoming actual fear. As we try to drive a wedge between the insurgents and the people, the insurgents are trying to drive a wedge between the people and the government," said Col. David Sutherland, commander of the Army's 3rd Brigade, 1st Cavalry Division. Meanwhile, the provincial government hasn't met in at least three months because of the violence, and the Iraqi Security Forces are now viewed by many as operating along sectarian lines. There's not much for the people of Baquba to be optimistic about. Piles of trash litter the abandoned streets of Baquba, a city of 300,000 people.